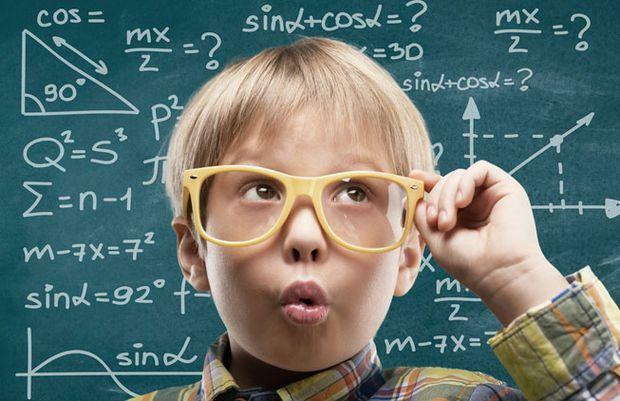 Home Mathematics Zero Divided By Zero: Is There More To It? Zero Divided By Zero: Is There More To It? Is this only an insolvable question or can it also lead to some useful conclusions? “Imagine that you have zero cookies”, Siri’s response begins, “and you split them evenly among zero friends. How many cookies does each person get? See? It doesn’t make sense. And Cookie Monster is sad that there are no cookies, and you are sad that you have no friends.” This is the comical answer that Apple’s vocal interface, Siri, responds with when asked what zero divided by zero means. The answer seems absolute and one may think that Siri is questioning the sanity of a person asking such a question. the question of dividing anything by zero becomes more of a philosophical question than a mathematical one. But really, is that all there is to the problem of zero divided by zero? In mathematics, anything divided by zero is undefined. For example, when we take zero and divide it by any number, the answer can never take us back to the original equation. Division is the inverse of multiplication, and in principle we should be able to trace the original equation back from the answer. But that is impossible when a zero is involved; it seems as if all of mathematics breaks down when we approach this mysterious number. Thus, the question of dividing anything by zero becomes more of a philosophical question than a mathematical one. The number is much like a black hole, where everything seems to stop and anything that interacts with it can never be restored to its original state. Consider the problem of multiplying anything by zero. Subatomic particles such as photons and bosons have a zero rest mass. By that logic, the momentum of these subatomic particles would also be equal to zero, which we know isn’t true for all cases. So the logical problem of 0/0, or anything divided or multiplied by zero, which can be equally argued to equal zero as well as one, depending on a person’s perspective, has real world applications. How can it be equal to one, you may ask? If we divide 0.01 by 0.01, we will get 1 as the answer. Similarly, if we take the equation 0.0000001/0.0000001, the answer will still be one. So as we approach zero by increasing the number of decimal places, one may argue that an approximation of 0/0 will also be equal to 1, since 0.00000001/0.00000001 is equal to 1. Mind boggling! Isn’t it? This is another example of why zero divided by zero can be looked at in such different ways. However, one may be surprised to learn that in calculus, zero divided by zero has a lot more significance and applications than people realize. 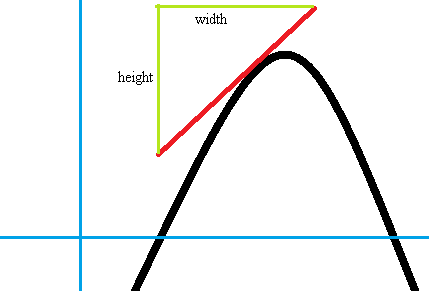 Consider a curved graph on the XY axis. One may draw a tangent at a point and find its slope or gradient at that point. Simple enough! But what about curves with slight curvatures, where it might be difficult to figure out where the tangent may be drawn? How can we find the derivative there? Where the tangent is unclear, we can figure out the slopes of two cutting lines. The height and width between the two lines will give us the gradient. But as we decrease the height and width of the triangle, the gradient will approach accuracy. 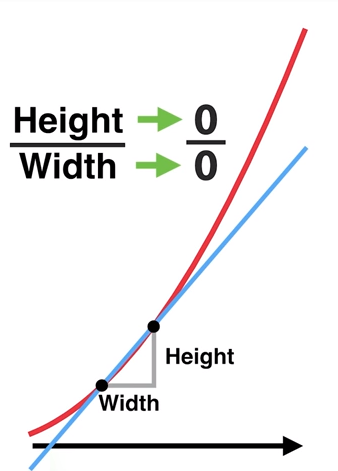 Hence, the zero as height and zero as width will help us find the tangent. One may ask here, how? Consider the graph of the function of x2. 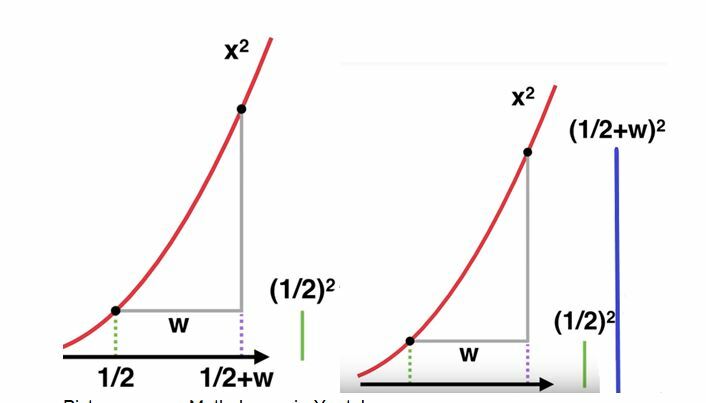 If we suppose that the limits are ½ and ½ + W, where ‘W’ is the width of the triangle and consequently the number of units covered on the x-axis by the tangent, we will be able to come up with an expression for the height of the triangle. As we plug in ½ and (½ +W) into the equation y=x2 and find the difference between the two expressions, we obtain the height as the expression 2(½ )W +W2 after expansion. 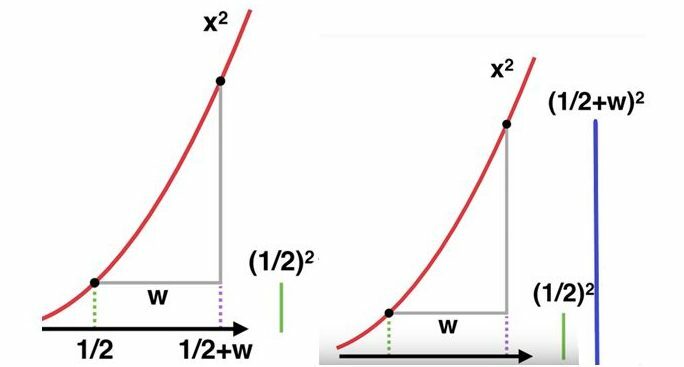 So when we find out the gradient of this point on the curve, we are left with the expression ‘2(½ )+ W’ when we divide ‘2(½ )W+W2’(height) by ‘W’ (width). Here is where the assumption of zero divided by zero comes handy; as we’ve supposed that the smallest value we are taking for width in order for the derivative (tangent) to be as accurate as possible is zero, we are left with 2(½ ) which is basically 1 after we substitute W=0. You can test this out yourself. The differential of x2 is 2x by the differential formula. At the point x=1/2, the derivative (or tangent) is equal to one. Viola! Thus it can be said that, in a way, zeros have helped us find the roots of calculus. Where they seem to break all rules of algebra, they form the fundamentals of another branch of mathematics. And that is the beauty of this subject. The infinities and uncertainties are just as important as anything else!